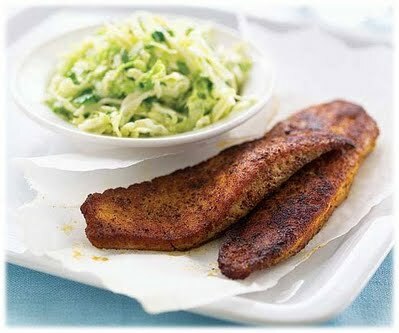 Cajun is a great seasoning paired with tilapia because it provides a little kick to the somewhat bland fish. We also recommend eating this dish with some grilled vegetables, rice, or green lettuce salad. This makes for a healthy dinner option that doesn't sacrifice quality or flavor. Soak your wood chips and light your smoker until it reaches 225-250 degrees Fahrenheit. If you have a charcoal smoker, it will take 30 minutes for it to come up to temperature. Gas grills are faster and should heat up to the right temperature in about 5-10 minutes. Mix all of your tilapia seasoning ingredients together and rub them on the tilapia fillets. Next, drizzle your lemon juice over the top of the fillets to flavor them and add moisture to the smoking process. Place the Cajun seasoned tilapia fillets on a sheet of aluminum foil sprayed with non-stick spray and lay them on the grates of your smoker. This will help the fillets from falling through the grates of your smoker. Open the vent completely open to allow airflow and smoke to billow out the top. Check the tilapia after about 1 hour and make sure your temperature is holding at 225-250. Add wood chips and continue cooking for another half hour to 1 hour longer. Serve each Cajun smoked fillet with grilled vegetables, rice, or a green lettuce salad. The cooking time for this recipe is about 1 1/2 hours to 2 hours total to smoke. Your tilapia should become a white color in the center with a flaky texture.